In which it’s time for more than just the audience to wave goodbye to Ohtori Academy. Click here for an explanation of the watch party, and an invitation to chime in with your own thoughts (Tumblr tag: #Utena Watch Party). And my own newbie-friendly commentary is below the jump. Somehow I’d forgotten how beautiful and heartbreaking and hopeful this finale is, and then I watched it twice over the past couple weeks and I remembered each time. I remembered so hard that my roof sprung a leak and it rained a little on my face (Vrai’s too, from the sound of it—those pesky roofs). Utena is a tremendous work of art start to finish and this finale is nigh perfect, leading each of our characters as well as the story’s overarching ideas and themes to logical, emotional, and satisfying conclusions. But I’ll do my best to use words instead of gifs to wrap this watch party up instead. Since none of you are technically Utena newbies now, you can read Vrai’s posts without spoilers (well, they discuss the movie a little, but usually in vague enough terms that I wouldn’t worry too much about it), so there’s no real need for me to piggyback off their (most excellent) analysis this week. Instead, I figured I’d just stick to my own final episode notes and focus on my favorite things: Character growth and thematic movement. So let’s talk Utena, Anthy, and the new fairy tale they’ve created together. After a brief recap of last episode’s shocking betrayal (as if we could forget), the series swoops us out of the dueling arena and back over to our unchosen StuCo, sharing food and stories like they’re actual friends or something. 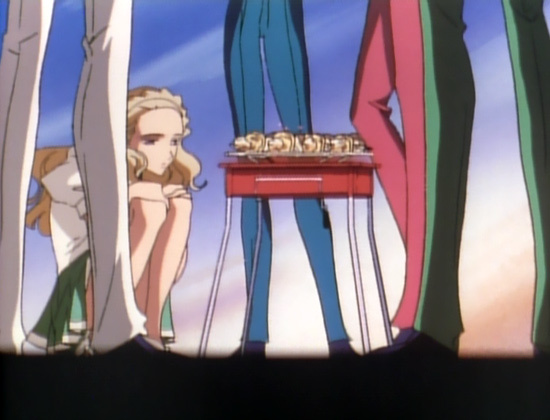 Touga (for once) holds the team together by reminding them that Utena is their representative, so they’ll stand with her in spirit if not in body. There’s the sense that the outcome will give the StuCo a better idea of what they can do from here on out—if there’s any chance of them smashing any shells in the future, or if Akio and his destructive system will reign supreme forever—so even though this episode is very much Utena and Anthy’s, it matters for our extended cast, too. The highlight of this scene, though, is Jury’s seemingly out-of-nowhere story about the boy who tried to save her older sister from drowning. He failed, dying in the process, but Jury swore to remember his name… only to discover that she’s forgotten it after all. This story forms the backbone of a major scene in The Adolescence of Utena film, so bookmark it, but in the context of the series itself I think it serves a few purposes. First, it’s yet one more example of how frail and faulty memory can be, and how it can fail us despite our best promises and efforts. 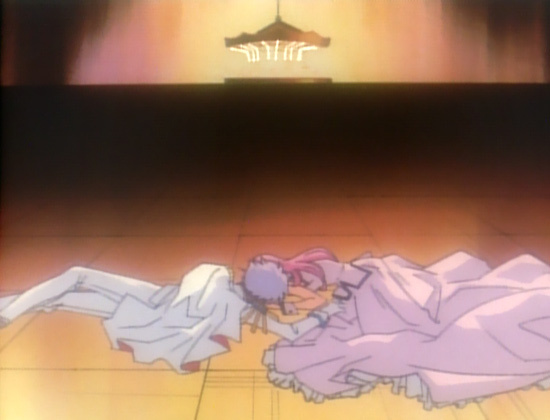 Given where it’s placed in the episode, it also feels like ominous foreshadowing: Utena herself has, seemingly, failed in her attempts to save Anthy, and so perhaps her future is to become a forgotten name, just one more person (like Mikage before her) who failed to oust the reigning chairman. Failed revolutionaries rarely appear in the history books, after all (and are more often than not portrayed as extremists or villains when they do). It’s no wonder Nanami’s so unsettled by Jury’s decision to mention this story now of all times. However, as dismal at it is, like much of this episode there are scraps of hope in it. The boy’s name is lost to memory, but Jury still remembers what he did, and now the other StuCo members undoubtedly will, too. He’s become a character in a story, “the boy who tried,” rather than a distinct individual, but he hasn’t been forgotten, either. In the world of Utena and storytelling in general, people are the sum of their actions: the intent of them, the meaning behind them, and (perhaps most importantly) what impact they left on others. It’s reminiscent of Dios and Anthy’s own transformation into faceless archetypes, and seems to suggest that such transformation is inevitable, tragic, but also somewhat hopeful and not without value to those who pass those tales on to others. Individuals become stories, and a story’s meaning takes shape in the hands of its storytellers. The villagers turned Dios and Anthy into “the prince” and “the witch,” holding all genders up to restrictive standards and impossible ideals and serving as a warning to girls to be subservient and passive “princesses” all their lives. So what, then, will Utena become, once she’s left Ohtori and exists only as a story the students tell to one another? Will she be a cautionary tale, or an inspirational one? And so we come to Utena’s last real challenge: What to do when you’ve seemingly exhausted your options, when someone you know is in pain violently rejects your attempt to help, when the “princess” won’t let you carry them off on a white stallion into the sunset? 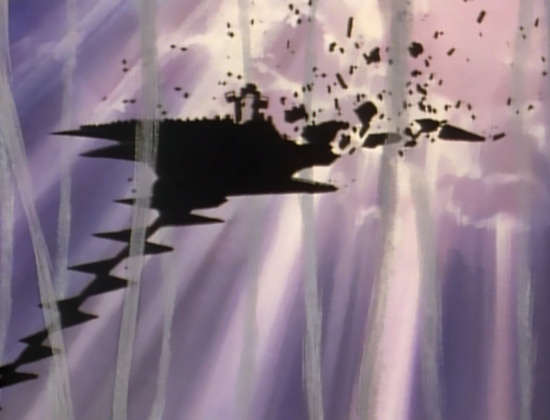 The first half of this episode is, I think, a kind of last temptation for Utena, a chance for her to back out. Everyone around her—Anthy, Akio, and “Dios”—tell her she reminds them of the prince from the legend, noble and genuine in her attempts to help others. They also all tell her she’s failed, primarily because “girls can’t be princes,” but Dios himself “failed” as well, so it’s not just that. We’ve spent 38 episodes exploring how the prince/princess system damages everybody, even the prince, who cracks under the weight of his inability to save everyone, becoming the cynical, manipulative, and ultimately impotent End of the World, ignoring those in pain in favor of some abstract notion of “power,” slashing at a wall with a stolen sword until it shatters and the world remains unchanged. This is the unspoken fate of one who “resembles Dios,” the end game of “the prince,” and what Utena herself could perhaps become, depending on the path she chooses here. When Dios speaks to her, I see it less as an actual Dios and more as Utena’s own internal struggle. He spins on an endless carousel, going nowhere like Akio himself, and tells her to take a rest. They’ll heal her when this is over and she can go back to being an ordinary student. It’s nothing to be ashamed of. She just wasn’t strong enough. Akio wields the power in this world, not her. But that’s okay, she did her best, so she shouldn’t blame herself. And running through all of this is Akio’s own cynicism, and an unspoken implication: Some people just can’t be helped. Utena violently rejects this, slamming the kissed rose crest into the ground, shoving Akio (hilariously) out of the way, and traveling to the Rose Gate herself. Her sweat and tears and honest declaration of love are not the actions of a prince climbing a tower and carrying a princess passively away, but of an equal reaching out to someone in a bad place and offering them aid. At this point, Utena knows what it means to be a prince and she wants nothing to do with it. She just wants to help someone she loves escape her torment. And for the first time, instead of standing in front of Anthy with a sword or dragging her forcibly out of harm’s way, Utena looks her straight in the eye and offers her nothing but an extended hand. Anthy’s tale is beautiful on approximately every level, from the more direct, intimate story of a young woman finding the strength to walk away from an abusive relationship to the broader and more abstract story of reworking our own cultural myths. Ikuhara wrote himself down a narrow path, here: Anthy needs to break free of her coffin in order to prove Akio wrong and show us there’s a way out of this toxic system, but we’ve spent so long deconstructing the princely fairy tale that we know a traditional savior/saved ending would just box everyone back up into a new toxic system, albeit one with slightly looser gender roles. It would also, in the end, be highly unrealistic, and for all that Ikuhara loves the abstract and surreal and is, I think, an optimistic storyteller, he’s also uninterested in (and even hostile towards) perfect, romantic happily-ever-afters, because those endings are escapism, not viable answers. So where does this narrow path take us? 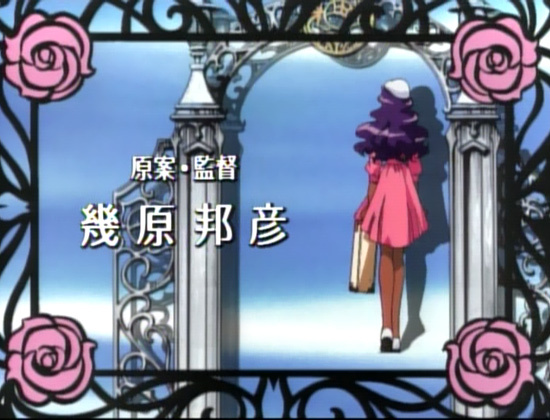 To the Rose Gate, which Akio tells us “seals the power to revolutionize the world.” Assuming he’s right, and given that Utena opens the gate to find Anthy’s coffin on the other side, this means the power to revolutionize the world is Anthy herself—the real, honest Anthy, no longer hidden or disguised by her Rose Bride gown or witch’s dress or bound hair. Utena’s “revolution” isn’t about some mythic hero coming along and kicking over the ruling authority. It’s about the power each individual has to change their own world, and give others the hope and courage to do the same. For all that Utena is heavily influenced by western fairy tales, its message is more Buddhist than Judeo-Christian, as it understands that, in the end, the only person who can truly save you is yourself. 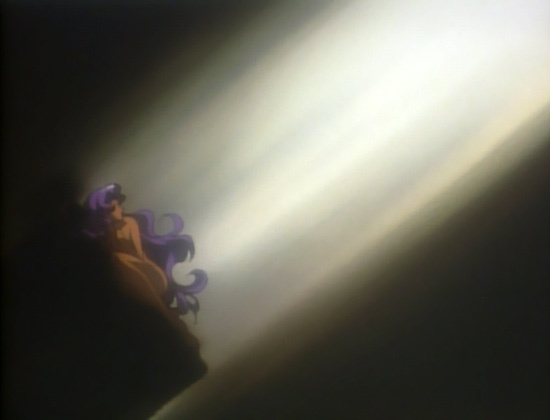 That doesn’t mean the love, support, and wisdom of others isn’t vital to the process—it is, and it’s hard to imagine that Anthy would have found the courage to leave her coffin if Utena hadn’t pulled back the lid and offered her hand, an alternate path to this endless cycle of pain and isolation. But Utena can’t reach Anthy on her own; Anthy has to be the one to reach out and take that hand, and pull herself up out of the box where she’s sealed herself. That she does is a testament to the love these two feel for one another, and the hope and strength which Anthy has always had within her. She just needed someone to remind her it was there. I know I keep repeating this quote with my Ikuhara final episode analyses, but it so perfectly encapsulates his view on how systems work and how we enact change that I can’t help but recycle it here, too. In Utena, we see this literalized, as the arena (a.k.a. 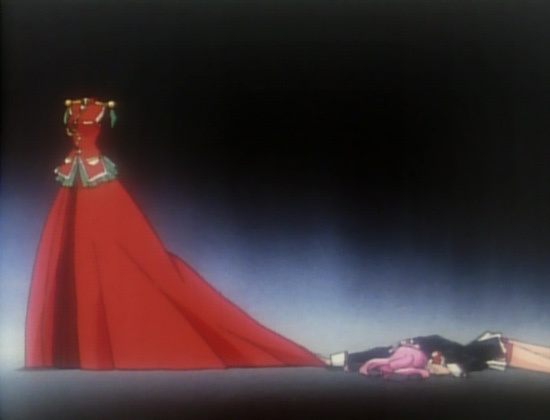 “the ground you’re standing on”) collapses around Utena and Anthy when their hands touch, Anthy’s coffin drops, and the swords of human hatred attack Utena as soon as she apologizes for “pretending” to be a prince. She’s apologized for believing in the system at all, and so the swords forcibly remove her from this world they’ve built, which is so heavily reliant on hating anyone who doesn’t align with the narrow prince/princess roles. It’s a painful, frightening scene, to be sure. Breaking free of a destructive belief system you’ve followed your entire life is painful and frightening. But this is a joyous, hopeful ending, not a dismal one, and the epilogue (and official art) take care to assure us that Utena neither failed nor died but simply moved on to another world (keep in mind that when Ikuhara talks of “worlds” he’s speaking less about physical communities and more about ways of thinking), and Anthy is on her way to join her. Our young protagonists can’t be bound by the rules of Akio’s world anymore. They’ve both found another way, a better way where people can meet as equals instead of protectors and protected, princes and princesses. And unlike Mikage, who could never quite break free of the dueling system and so could only “graduate,” still a member of the school and forgotten by the students as a result of it, Utena and Anthy ditch Ohtori altogether, forging a life that doesn’t need the academy’s seal of approval. 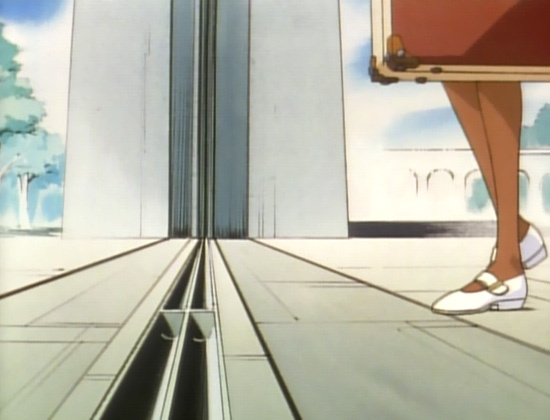 Which brings us to the epilogue itself, and return to the question posed during the first scene with the StuCo: What is Utena’s lasting impact, the story she will leave behind at Ohtori? The answer is, like that of the boy, bittersweet. Her name is already lost to memory, but the general student body still remember her actions in a vague sort of way: She “dressed like a boy” and got into fights with the teachers because of it. This reads almost like Ikuhara acknowledging the most basic and common interpretation of Utena as the story of a girl who challenged gender norms. It’s not wrong, mind you, but it’s only a small part of a much larger tale. Even so, there is something of value to be taken from it, and hope that her legend will grow to inspire others to also consider the how and why of these gendered expectations, and encourage them to challenge those norms, too. There’s still work to be done, which is why everyone else is settling back into life at school, neither ready nor willing to leave the grounds with Utena and Anthy yet. The chick needs the protection of its egg, and there’s no shame in that so long as the chick is able to break free when the time comes. The hope and promise of Utena is that each person has within them the ability to one day do that, and to inspire others to do the same. That even those sealed most tightly in their coffins, most violently pierced by the hatred and censure of others, can break free and walk a new path not confined by the expectations of others. All we need is that one extended hand, whether it’s in the form of a beloved person, an important event, or even a resonating story. 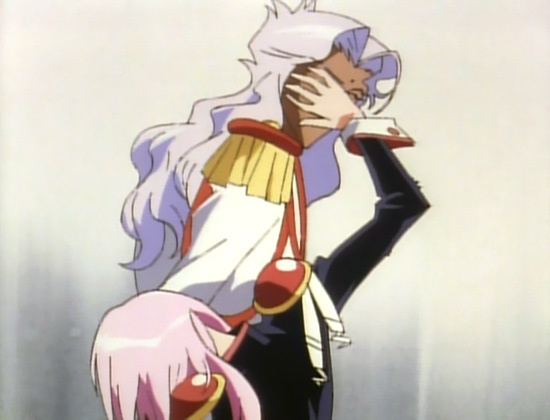 Perhaps Revolutionary Girl Utena seeks to be that extended hand as well. And that’s all she wrote, gang! As I’m sure you all know, there is The Adolescence of Utena, a film that’s one-part retelling, one-part spiritual sequel to the TV series, but I’ve opted to end the watch party here rather than cover the film as well. This is partly a scheduling thing and partly a personal thing: The Utena movie is gorgeous to look at and evokes a mess of emotions, but for me there’s something sort of… visceral about it, I suppose, to the point where I prefer to just experience it rather than try to talk about it. Vrai is planning to cover it, though, so you can visit their blog for that! As for all you readers out there, congratulations to any first-timers for a successful completion of Revolutionary Girl Utena! I hope these watch parties were helpful in navigating the sometimes murky waters of this series, and now that you’re finished, definitely don’t forget to go check out Vrai’s own commentary, as they have some great retrospective analysis (particularly involving Anthy) which you just can’t do in newbie-friendly posts like mine. And for those of you who already saw the show and opted to read these anyway, a thousand thanks to you as well, and with any luck some of my many, many(!) words gave you something new to chew on too. This was a blast. A long, sometimes exhausting blast, but a blast. I love this series and hope these posts have helped others come to love it, too. Go forth, smash some shells, and enjoy your next Utena rewatch. I know I always do. Screenshots snagged from Empty Movement. Missed an episode? Up for a re-read? You can click here for a complete list of Utena Watch Party posts! THANK YOU SO MUCH! I decided to watch Utena because of the Watch Party, so thankyouthankyouthankyou. You are very welcome! Glad to know these were helpful and doubly glad you’ve finished Utena now! Any day I can help someone else get into this awesome show is a great day in my book. P.S. Get yourself a Patreon account already! You may be done with “Utena”, but I’m still following your “Sailor Moon” newbie reviews with pleasure; I’d like to be able to give you more than my thanks. Wow, yeah, I’d never really thought about the parallels between this and Omelas, but you’re absolutely right! No wonder both stories resonate so much with me. And you’re welcome! Like I told Gabriela above, any day I can help someone get into Utena is a good one in my book. I’m flattered to hear you’d be willing to contribute to a Patreon, and it’s certainly on my to-do list. 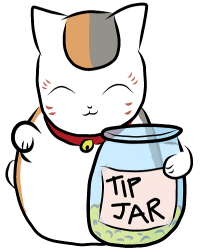 I just keep getting busy working on projects and never get around to actually, y’know, finding ways to fund them. Maybe now that the Utena posts are over and I have a scrap of free time, I’ll look into setting that up. Thank you so much for writing these!!! I just finished watching the entire series for the first time, and your recaps offered so much insight and joy. Thank you again!